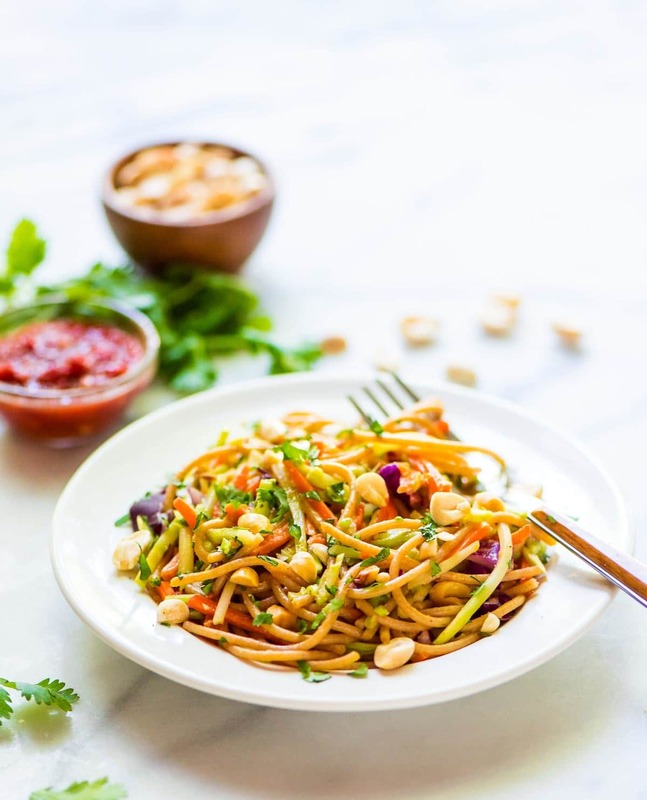 Asian Noodle Salad with Peanut Dressing is an AMAZING cold pasta salad. Quick and easy, this Asian pasta salad recipe has been lightened up from the original! Great for a cookout side dish, or add chicken to make it a full meal. Picnicking in Madison, Wisconsin is a competitive sport. Each summer, the city hosts weekly outdoor concerts, and thousands of residents flock, unfold their blankets, and pull out the most epic collections of picnic food that I have ever witnessed. When we lived in Madison, I attended almost every one, and today’s recipe for Asian Noodle Salad is the dish I most often loved to bring. It’s fresh, feeds a crowd, and was a long-standing favorite amongst our friends. I was ill prepared for my first Wisconsin concert. I arrived ten minutes before showtime with a half-empty bottle of wine and nothing else. Rookie mistake. In addition to listening to music and eating, the other primary activity at these outdoor concerts is to compare your picnic spread to those of neighboring groups. Forget the solo cups and PB&J—at the Madison concert scene, you best go big or go home. I’m proud to report that, by the end of summer, my friends and I could be ranked among the picnic elite. Everyone brought something homemade to contribute, we used real forks and plates, and I even invested in a set of wine glass picnic sticks. Homemade cold pasta salads like today’s Asian Noodle Salad are my go-to contribution for any picnic or cookout. This recipe tastes excellent both cold and at room temperature, travels well, and is a universal hit anywhere I bring it. It also tastes fabulous left over, so when my friends and I go overboard and bring more food than we can finish (the best kind of picnic problem), I’m happy to keep the leftovers for lunch the next few days. This Asian Noodle Salad recipe is easy to throw together and requires zero cooking beyond boiling the noodles. Do not, however, be deceived by its two simple steps—Asian Noodle Salad is a flavor monster. Creamy peanut butter, zingy ginger, sweet honey, and a kick of Sriracha combine to create complex layers of flavor that will keep your fork wandering back to the bowl. 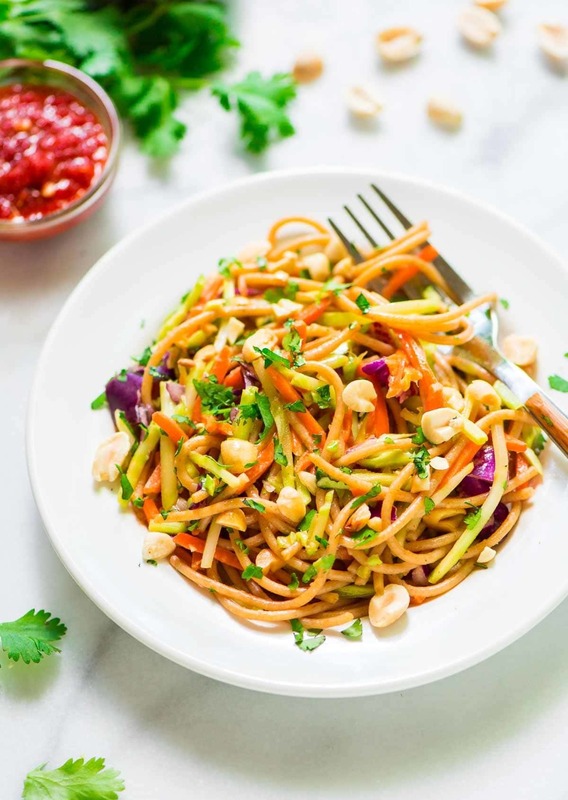 In addition to being addictive, this Asian Noodle Salad is also healthy and packed with veggies, thanks to a product I’ve been adding to my slaws and cold pasta salads for years, Mann’s Broccoli Cole Slaw. I’m ferociously committed to eating my daily veggies, but to be honest, I don’t enjoy washing and chopping them. Mann’s sells a wide variety of pre-prepped vegetables (we go through 3-4 bags of the broccoli a week), so when Mann’s asked me to contribute a recipe to celebrate the 25th Anniversary of its Broccoli Cole Slaw, I said yes right away. 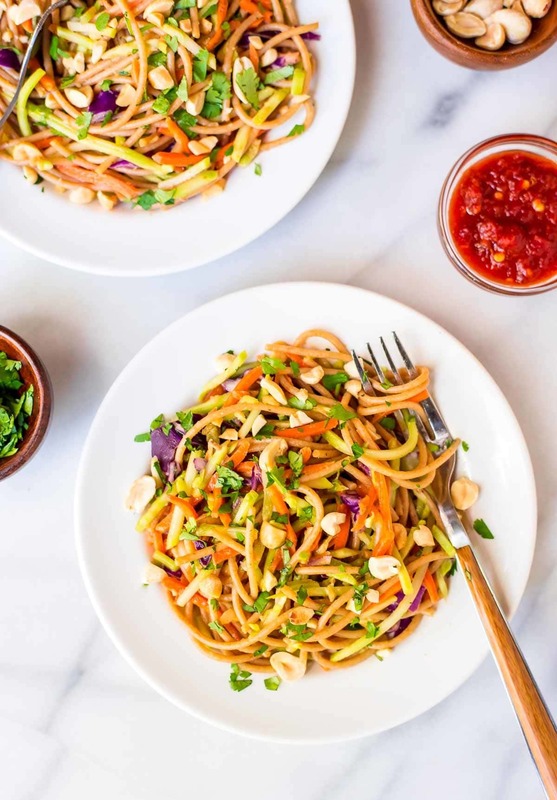 This Asian Noodle Salad is part of that celebration, and I’m excited to share it with you today! 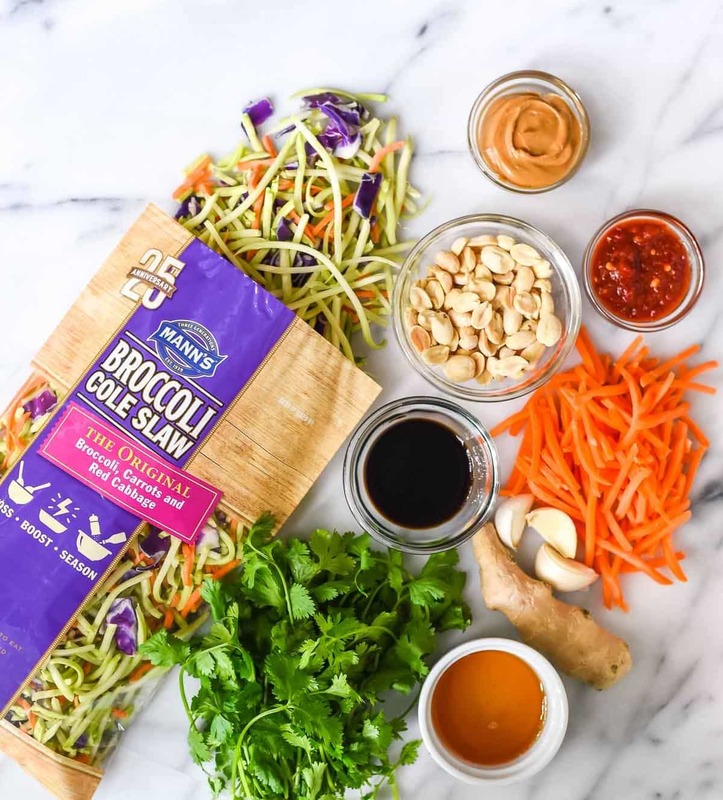 Broccoli Cole Slaw is the perfect way to sneak veggies into this Asian Noodle Salad, because its mild taste is almost imperceptible, and its thin cut blends seamlessly with the thin noodles. The overall effect is similar to a spiralized veggie pasta, minus the work of actually having to spiralize (plus, we still get to eat pasta!). The broccoli and noodles tangle together, and the rich peanuty sauce coats every morsel. Translation: the euphoria of a total pasta binge, despite the fact that the majority of what you are shoveling into your mouth is vegetables. Healthy eating VICTORY! Asian Noodle Salad is lovely as a light side dish or lunch. To make it more hearty, I also like adding shredded chicken and edamame for a protein boost. I haven’t tried it with tofu yet, but I think it would be an excellent vegetarian option as well. 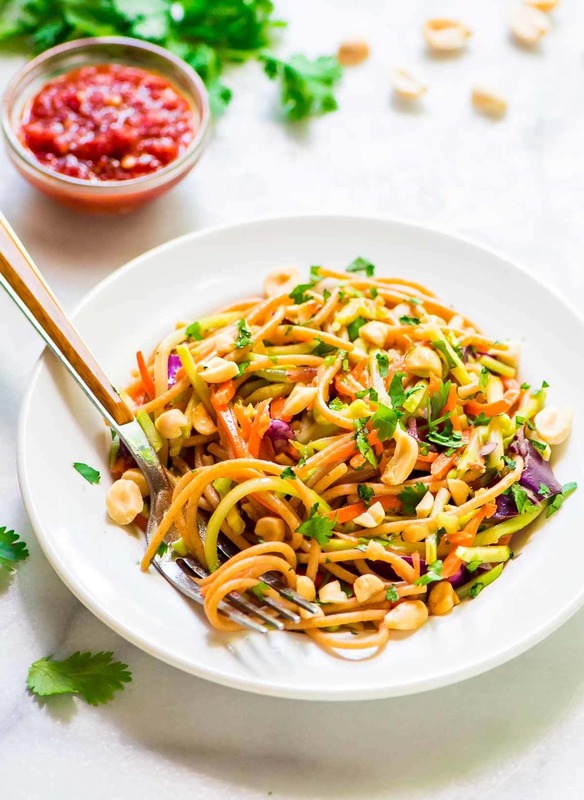 Asian Noodle Salad with Creamy Peanut Dressing. A flavorful, easy, and healthy cold pasta salad recipe! Easy to make ahead and feeds a crowd. Bring a large pot of salted water to a boil. Cook the noodles until al dente, according to package directions. Drain and rinse briefly with cool water to remove the excess starch and stop the cooking, then transfer to a large serving bowl. Add the broccoli cole slaw and carrots. While the pasta cooks, whisk together the olive oil, rice vinegar, honey, peanut butter, soy sauce, Sriarcha, ginger, and garlic. Pour over the noodle mixture and toss to combine. Add the peanuts and cilantro and toss once more. Serve chilled or at room temperature with additional Sriracha sauce as desired. Asian Noodle Salad can be served cold or at room temperature. Store leftovers in the refrigerator in an airtight container for up to 3 days. I am sharing this recipe in partnership with Mann’s. Thanks for supporting the brands and companies that make it possible for me to continue to create quality content for you! Oh I am loving this! Especially the part where it’s mostly vegetables but you still get your pasta fix. I feel you there! Pinning, sharing, making soon! Cheers! I like the sound of this salad. I would probably use garlic powder instead of fresh garlic, though, because fresh garlic for me has a strong, too long lasting flavor. Just pinned this yummy recipe! I love noodle salad’s and the dressing for this one sounds perfect. Erin, that pasta looks amazing! I can’t wait to make it and bring it to my next beach day picnic! My boyfriend is a little picky but he would LOVE this! Thanks for sharing! Made this tonight! yum! My husband loves it too. Elizabeth, HOORAY! I’m so happy to hear you enjoyed it so much. Thanks for sharing your review! hey girl- those picnic’s sound like so much fun! This looks so yummy! Hi Erin, I made this salad today and it is so, so good! It’s impossible to convey with words or photos (yours are gorgeous though!) how amazing the flavors are here! Thank you so much for this recipe! We used shredded cabbage in place of the slaw. Also, if you’re serving this to picky eaters, it should be stated that the peanut butter does not dominate here, especially if you serve the chopped peanuts as a topping on the side. Cilantro on the side too and that was enough to please everybody! Thanks again from Austria! I’ve made this salad twice and it’s a winner! We love the sauce, the crunch, and especially that it’s a bright, healthy dish. It was the main course at dinner last night for five friends, and all asked for the recipe. So Erin, thanks for another recipe I can use as a go-to salad or entree in these hot days of summer. Wish I could send you the photo, since it was a lovely bowl to behold. Marnie, YAY!!!! I’m so so happy to hear that you enjoy this recipe so much. Thanks for taking time to leave this kind review and for sharing it with friends too! Wanted to let you know that I stumbled onto your site a few days ago and made this last night — it was delicious! I added baked chicken tossed in hoisin sauce for a little extra protein but my boyfriend and I both decided it was a keeper. I love your regular combinations of veggies, protein, and a carb. It makes a balanced plate and a tasty meal. Thanks! Elyssa, WELCOME! I am so happy that you found my site and loved this recipe. Thanks so much for trying it and for leaving this kind review. I’m going to give this a try with spaghetti squash instead of noodles… I’ve had good success with coodles (cucumber noodles) and zoodles (zucchini) but I have TON of spaghetti squash right now! I’m so curious to find out how it turns out, Jami! I hope you enjoy the recipe! Turned out really good. The spaghetti squash made it filling I thought. Looks wise, the zoodles/coodles look a little prettier, but it was more fitting for Fall. I’m so glad you enjoyed it, Jami! Thanks for taking the time to report back! WOOHOO Rachel! I’m so glad to hear the recipe was a hit! Thanks for sharing your tweak with the bell peppers! That sounds delicious. I really appreciate your taking the time to report back! I made this and it’s so delicious!! Thank you. YAY Nicole! I’m so happy to hear you enjoyed the recipe. Thanks so much for taking the time to leave this review! This recipe looks amazing! What are your thoughts on using sesame oil in place of olive? Hi Rebecca! Sesame oil, while delicious, has a much, much stronger flavor than olive oil. I’d swap out 1 tablespoon max, see how you like the flavor, then you can always add more. I hope you enjoy the recipe! I made this with zucchini noodles and it was fantastic. Didn’t miss the pasta at all!!! Making again this week for a pot luck on Saturday. I know it will be a hit and I love that I can do the prep ahead of time. Thanks so much for this recipe!!!! Great idea about using zucchini noodles, Diane! Thanks for giving the recipe a try and sharing how it went! Hi Rachel, I hope you enjoy it! I recommend a 100% buckwheat soba noodle, which is gluten free, but you’re correct that some soba has wheat flour added, so label checking to make sure you’ve got a gluten-free type is definitely important! Love how colorful this is! Will have to try soon and maybe throw in some zucchini noodles! Adding some zucchini noodles is a great idea, Sarah! Thanks! Stacey, I’m so glad you enjoyed the recipe! Thank YOU for taking the time to leave this nice review! This looks delish but my kiddo has a peanut allergy. What would you suggest as far as a sub that doesn’t sacrifice flavor? She can eat tree nuts. Thanks! Hi Phyllis, you can use another nut butter in the sauce. Cashews would be a good sub for sprinkling on top instead of peanuts! I hope you enjoy the recipe! Will this be ok if I make it the night before I want to serve it? I have a potluck at work and I don’t think I will have time in the morning to make it. It looks delicious! Definitely Sharon! I hope you all enjoy it! THANK YOU!!!!!! I Just made this, and it was delicious! I will serve it with chicken for my husband. FYI. I put it into the WW app and 1 serving is 5 points. I used brown rice noodles and that turned out great. Does it freeze well? I don’t think we can consume that much in 3 days. Hi Caroline, I’m so happy to hear you enjoyed this! I have not tried freezing it, and I fear it would get mushy once thawed, so if you’re finding it makes way more than you’re able to eat in the few days it will keep in the fridge, I’d recommend halving the recipe. Made this for lunches for the week for me and my husband- AMAZING! Only minor changes I made were…I subbed out some of the broccoli slaw and added in edamame and red pepper and I used maple syrup for the sweetener in the dressing to make it vegan. So delicious! HOORAY Kristen, thanks for taking the time to leave this awesome review! I’m so glad the recipe was a hit! I made this for an Easter Day picnic. I misread the amount of pasta and used 1lb. All was well though, I made an extra batch of peanut sauce and mixed it in. It was a hit! All the veggies from the broccoli slaw made it crunchy, and there was a nice spicy kick from the sriracha. I will definitely make it again! I am so happy you enjoyed it Mona! This dish is amazing! I made it last night and my wife couldn’t stop talking about how good it was. Very easy to make and I know I will make this again before too long. My wife even shared the recipe with her friend. I made some slight tweaks to the sauce, but overall it is fantastic. Thank you so much for your positive feedback, Dan! I’m thrilled you both enjoyed this recipe! Love this recipe! I made it for a BBQ tomorrow and my husband and I ended up eating some for dinner tonight… our friends will never notice some missing ? I served it with fresh lime juice squeezed over top, too, which I love over my pad Thai and it was great! Thanks for sharing! Demi, HOORAY! I am so so happy you enjoyed this. Thanks for taking time to leave this lovely review! So happy that you all enjoyed this Julie, THANK YOU! I’m planning on making this salad for Easter. How many days in advance can you make it? Hi Ellie, I usually store this in the fridge for up to 3 days. I hope you enjoy!